Superior diamond teeth design for greater gripping ability. 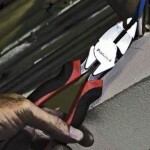 Hardened cutting edge cuts various types of wires. Special high leverage design for increase cutting power. Ergonomic and anti-fatigue comfort grip.